Both your dishes turned out well, but I have a special liking for the chicken/duck – yum. Hope things settle down for you soon! Both of your dishes look mouthwatering! I was also quite surprised at how delicious the orange salad was! Something I would definitely make again! Happy New Year, Karen! We really like the orange salad, too! Glad you enjoyed it and isn’t that the best when we didn’t think we would? The duck/chicken is great as well and you’re right that the sauce is what shines in that dish. Happy New Year! The orange and olive salad was a surprise! We thought it was very good and have made it several times now. The olives make a big difference. Although, we supposedly buy the same Nicosie olives each time, sometimes they are saltier than other times. I couldn’t find kumquats and think I used clementines, or was it cherries? I think the holidays have everyone’s homes and routines in chaos. Here’s to the New Year settling into happy routines! Nice orange-y catch up. I used Kalamata olives in the salad, and it worked. Of course, I was being lazy and didn’t want to go shopping. It was the only kind of olives I had around. 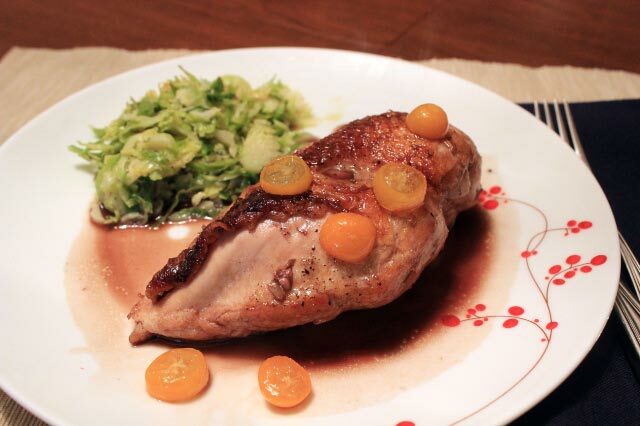 I like the idea of trying the kumquat sauce with chicken breasts. Clever! Have a great weekend. I loved the orange and olive salad – you are right, Kalamatas are the way to go. Next time I think I’ll make a salad with arugula, orange segments, and a tapenade vinaigrette. Sorry for the mishaps and sicknesses over the holidays. Not fun, for sure. Glad you liked the orange and olive salad as much as I did. I liked the Niçoise olives but, really, any olives that you like would be fine, I think, In fact, Dorie has a wonderful olive medley recipe in AMFT. I personally loved every duck recipe in Dorie’s book but chicken works as well. I wasn’t able to find kumquats but used figs. They were delicious as well. Nice post. Great make-ups. My son used to have 3 weeks off for the winter break but now that he is in middle school we are down to a normal 2 weeks. Much better for Mom:) Good luck with the aspic. 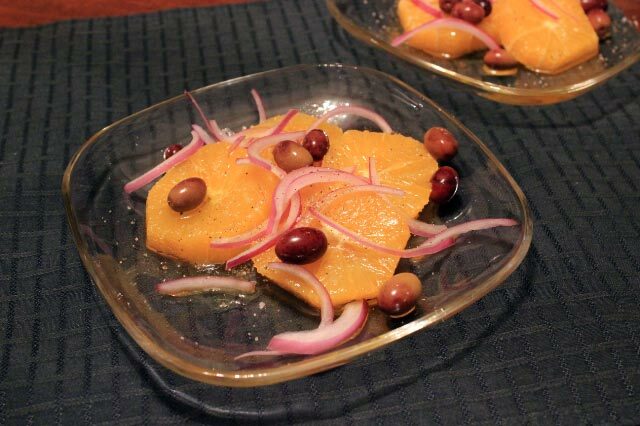 The olive orange salad was a pleasant surprise – I wasn’t sure how that one would work. Hope things have settled down!